I adored Ten Things Sloane Hates About Tru when I reviewed it last year, so I had to grab book two in the series! 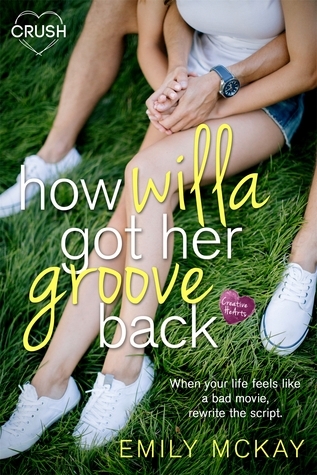 The second book in the ambitious Creative HeArts 12-book series, How Willa Got Her Groove Back features Willa and Finn, two 18 (or nearly 18)-year-olds thrust together by virtue of their parents' recent engagement, and their mutual distrust of the situation. Finn's mother, Mia, is a famous actress, so the fledgling relationship comes with a new set of life rules for Willa. Namely, trust no one, expect the paparazzi everywhere, and bye-bye most of your old life (e.g, your childhood house!). I felt Willa's frustration. She's been forced into a situation entirely out of her control, and a lot of the things she thought she could trust and rely on are being stripped away. I really enjoyed reading how she tries to cope, how she tries to protect herself, and how she so genuinely wants good things for her father, despite what it's costing her. From Finn's side, he's a lot more cynical than Willa. He's got a lot of good qualities, namely being protective of his mom, and then Willa by extension. His frustration with the adults for not doing a better job of preparing and protecting Willa put me on his side for much of the book. Unfortunately, he does seem to lack a bit of depth. I didn't get a great sense of what his life was like before his mom and Willa's dad's relationship brought to Austen. I didn't get a sense of what he actually wants to do with his life, beyond his current short-term goal. So, given that I loved Willa and thought Finn was decent, why only 3.5 stars for How Willa Got Her Groove Back? Because of the book's ending. As the second of twelve books in the Creative Hearts series, and the first of a trilogy for Willa and Finn, I get that even a happy-for-now ending for Willa and Finn might be rushing things. Totally fine! But I wasn't satisfied with the way *any* of Willa's plot lines were left, and because Finn seems so entirely wrapped up in those plot lines, he didn't add to my satisfaction. It's basically a cliffhanger ending but without a sense of urgency to really hook me or sense of temporary satisfaction to make me smile and want more. Again the positive sides, I love the Creative Hearts setting--the school is awesome. The development of the senior creative project is really cool (a plot that arcs across all the books). Though some characters from the first book are present in this one, it's not necessary to have read book one to read book two. You'll get tiny spoilers, but nothing major is revealed. I think there's so much potential here, and maybe when I can read all the books together in a week or two, I'll be more satisfied with this one? I really like the idea of How Willa Got Her Groove Back, and of the series, and I'm curious to see how it all pans out. But if you think you might get hooked by this series/book, I'd suggest waiting to read this one until closer to November, when the next Willa-Finn book is due for release, so you don't have to wait too long for some resolution. I didn't realize Emily was writing contemporary YA too. I will have to tell my friend Wendy to pick up this series for her daughter.